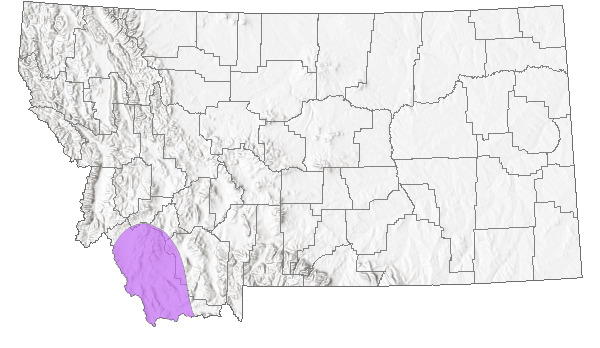 The species is at the periphery of its range in Beaverhead County where it is known from one large extant population on BLM and private lands, two historical locations and two other locations that need additional survey work. Agricultural conversion has significantly reduced available habitat. Additional impacts to K. americana from agriculture, grazing and/or invasive weeds are possible. Red Sage is a perennial subshrub having a woody base and simple or branched, herbaceous stems that are up to 5 dm high. The alternate, fleshy, linear leaves are 5-25 mm long. Foliage is sparsely long-hairy. Small clusters of 2-5 tiny, sessile flowers are borne in the axils of the upper leaves. The 5 hairy calyx lobes are 1-2 mm long, surround the ovary and 5 stamens, and completely cover the 1-seeded fruit. Petals are lacking. Some species of Suaeda are also subshrubs with linear, succulent leaves, but their flowers and leaves are glabrous. In MT in Beaverhead County; OR to MT south to CA, NM and TX (Lesica 2012. Manual of Montana Vascular Plants. BRIT Press. Fort Worth, TX). 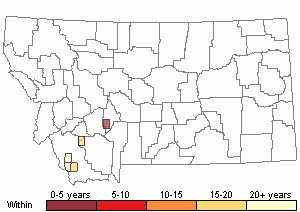 Saline or alkaline soil in valleys and foothills. Blackwell, W.H. Jr., M.D. Baechle, and G. Williamson. 1978. 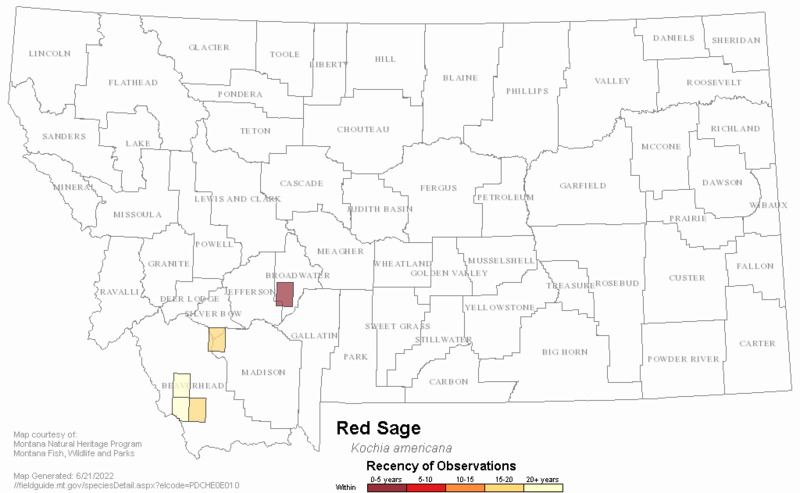 Synopsis of Kochia (Chenopodiaceae) in North America. Sida 7(3):248-254. Heidel, B.L. and J. Vanderhorst. 1996. Sensitive plant species surveys in the Butte District, Beaverhead and Madison Counties. Unpublished report to the Bureau of Land Management. Montana Natural Heritage Program, Helena, Montana. Vanderhorst, J. 1994. [unpublished memo of November 13, 1994 to B. Heidel]. 6 pp. Web Search Engines for Articles on "Red Sage"